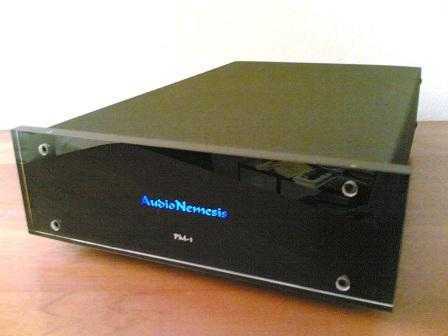 Our readers possibly remember that we already reviewed an AudioNemesis product, the DC-1 DAC. This proved to be a very interesting and unconventional unit, with very particular technical solutions, and a not so high price tag. It is a classical RIAA preamplifier, with a single input and a single output, designed and made in Italy. The cabinet is the same as DC-1, with a very refined and elegant design, and no extravagant cost. 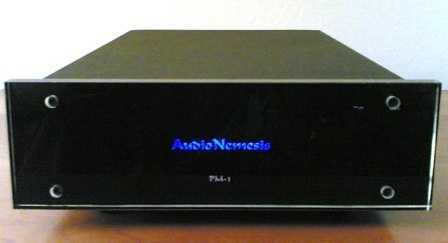 The front panel is transparent plexiglass, with a black background, a beautiful lucid finish, and the AudioNemesis logo lighting up in a deep blue. Side and top panels are obtained from a single metal sheet coated with a very rough and scratch-resistant gray powder paint, which also has some dampening effect. 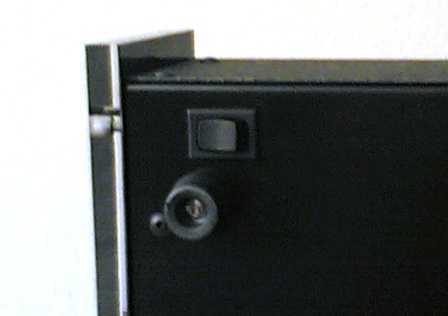 On the back panel, from the left, there are the power supply connector, which allows to use the power cord you prefer (in facts, you are strongly suggested to do so, especially because no cord is supplied...) and to move easily the unit, then the right and left channel output RCA connectors and the corresponding RCA inputs, with at the center the clamp for the turntable ground cord. Under each input connectors you can reach, through a small square opening, a microswitch, which allows to set the input resistance (47kohm or 1kohm), and to increase the input capacitance from 0 to 700pF with 100pF steps. The unit is very easy to use, you have just to connect it to the turntable and the pre-amplifier and switch the unit on. As a matter of fact, the input impedance is configurable, so that it can work perfectly with both MM and MC cartridges. Gain is not very high, but more then enough for MM and high output MC cartriges. With low-output MCs (a situation the PM-1 was not designed to cope with) the output level is obviously rather low, but probably still manageable in many systems (mine, for example), provided you are available to accept a correspondingly high noise lavel. There are not so many details known about the implementation. According to AudioNemesis site, it is a discrete components circuit (FET and BJT), with zero feedback, which probably means that there is no feedback loop (which is not exactly the same...). Said this, the solution is definitely valid. Also the choice of keeping the signal path as short as possible is noteworthy, as this helps a lot in keeping picked up electromagnetic disturbs low. The circuits implements a very precise splitted RIAA, that is the different time constants of the standard curve are implemented in different stages. This helps making the final adjustments easier, and also should produce a better dynamic beahvior. The layout, by Giuseppe Intorrella, is in general extremely accurate. 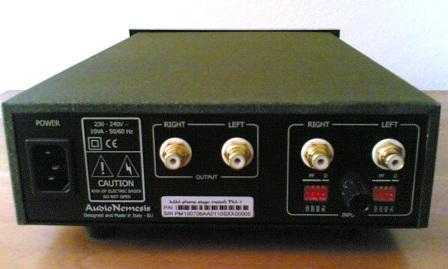 Given the definition as high level cartridge pre-amplifier, for most of the time I have been using a Reson Reca, cartridge, which is not such an easy source: with a 6.5mV output level at standard conditions, which is higher than the average, it makes more probable to highlight the dynamic limits of the pre-amplifier. This is never happened with AudioNemesis, which accounts for its accurate design. Just to finish with, I measured the matching error between the pre-amplifier frequency response and the RIAA standard curve. It shows that the pre follows the RIAA curve with remarkable precision. Taking into account the discrete component, zero feedback configuration and the fact that I measurd two different units getting almost perfectly matching diagrams, this is a really outstanding result. Apart the Reson Reca, I have been using also an Acutex 420STR, a top-of-the-line cartridge bought NOS a few years ago. It is a very transparent and precise cartridge, with very open, but at the same time relatively sweet and smooth, highs. With both cards the preamp has shown no problem or compatibility issue. The sound is globally very neutral, balanced. The bass is well present, deep enough, but rather controlled. Highs are transparent, clear, even though not very extended. Very high frequencies, however, appear to be not perfectly resolved, not completely smooth, even though never edgy. Going into in-depth analysis, notwithstanding the apparent neutrality, medium-high range seems a little back, or better just a little confused, if not slightly muddy. In any case, they seem to be there but at the same time to loose part of their effectiveness: female voices in particular seem sometimes a little far away. Male ones are instead full and rounded, very present, as though medium-bass was slightly prominent. Detail is very good, but not fully resolved: the sound is presented in a kind of very slightly cleaned up and simplified form, easier to listen to than the full message, as happens with some tube systems. The soundstage is rather wide and stable, natural. Impact is not bad. It seems more connected to the good presence of medium-bass range, than to the attack speed, which is in effects not huge at all. So drums sound a little rounded, not dry, fast and neat as you would expect. Background noise is very low, as far as to be completely hidden in normal use. This has driven me to setup a test with a DL103, and I must say that also in this situation (0.3mV) in facts noise remains relatively low, not disturbing at all. Even though it is presented as a MM pre-amp, and Camorani uses a step-up transformer with DL103, I would dare say that the unit might be used with medium-low output cartridges without too many problems. Wrapping up, a pre-amplifier with a pleasant and relaxing, never edgy sound. Sometimes it seems to indulge in the capital vices of tubular colleagues, and starts singing. It would be even better if sometimes it was able to loose control: as it is, it gives a perfect, correct, honest, even hearty message, but sounds a little contracted, a little softened, in one word not so compelling as it might be with a little more heart and liveliness. I was not able to interface the PM-1 with a Benz Micro Silver, an high level MC cartridge: it has a ferocious high range, difficult to tame; even though I spent some time trying seriously to solve the issue, I was not able to find any reasonable compromise, while this is not so impossible with other pre-amps. I must however confess that I tried hard for few hours, then decided to go for the Reca and completely forgot the Benz.. The PM-1 is an interesting phono preamplifier, with an elegant look, well designed, solid, with a neutral, controlled sound. Audiophiles might prefer a more detailed, fast, open and involving presentation. However given its pleasant and soft sound you can spend a lot of hours listening to your record collection with minimal fatigue. In this respect, it is a pre for people who love music more than hi-fi, which, as I always say, sounds more as an asset than a fault. Price seems in line with the excellent finish, the perfect industrialization and sound quality. Finally, a not minor detail: according to AudioNemesis web site, you can have it for a two weeks test. Take advantage. First of all we thank again Giorgio and TNT for the review. Regarding the lack of details on the audio circuit, this follows our idea: too many details could give wrong impressions. Anyway, the splitted Riaaa is the most important and the most unusual aspect. There are many reasons for this choice, among which, for sure, dynamic and max input voltage, as written by Giorgio. This choice was a "must” for us, so the rest was very natural, with bipolars and FETs in a zero-feedback and feedforward design (no loop). The overall gain is rather standard, 38dB. 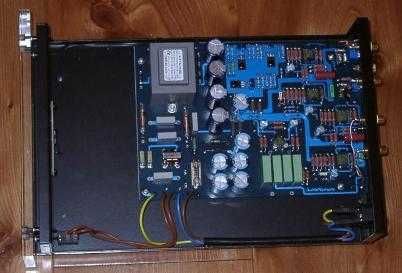 This is not a low gain preamplifier, but the gain is not high enough for low output MC cartridges. The power supply is really very important, so, as we did for the DC-1, there are shunt regulated supplies, but more sophisticated than in DC-1, because we have a very low level signal here. These supplies with short signal path and very high quality PCB allow a very low noise, as noted by Giorgio, really lower than many high cost and sophisticated preamps. Several battery powered preamps have higher noise! And PM-1 has no feedback! This is for the technical part. For the sound test, we have to say that we are a bit surprised. Regarding the bass response comments, we add that as for the DC-1 we want a very rich bass response, not a boom boom one. The bass from the PM-1 is rich, really full of harmonics. But it’s not prominent at all! And on the female voice and mid-high performance we can say the same: we can’t confirm this kind of result. Is there something wrong in the match with the source or what? Interfacing is the most important aspect of a phono preamplifier and the customer has 2 weeks for doing this at best, calling us for any suggestion. Yes Giorgio, we think that "zero-oversampling phono preamplifier" could be a very good definition! The family sound is clear. Thanks again to Giorgio for remarking that this is a Made in Italy product. This is not obvious for this price range. Thanks!